Welcome to the second post in our “Featured Tool of the Month” series on Real Estate Websites! Follow us as we break down our software, pixel by pixel. Today’s post focuses on the real estate website templates available in Realeflow’s Website Builder. In last week’s post, we focused on the importance and necessity of establishing a web-presence for your business and how you can easily set up custom websites in Realeflow using the real estate website builder. This week’s post focuses on the different real estate website templates offered in Realeflow. Whether you’re looking to establish a main real estate website for your business, set up multiple websites to target specific audiences, or both, Realeflow has everything real estate investors need to make it happen. Core Sites: this is what we consider a typical business website with 5-7 informational pages that can be customized to best fit your business. Squeeze Pages: these are one page websites that are designed to do one thing really well: Convert! Realeflow provides a wide selection of real estate website templates and copy for both types, allowing users to find a website style and message that best suits their business. What’s so special about our real estate website templates? We’ve spent thousands of hours over the past few years testing different websites to find the elements that produce the highest conversion rates! eBooks: free, digital book or report applicable to the “target audience.” As soon as a website visitor submits their contact information on your site, they will receive the corresponding eBook. Autoresponders: An email series initiated as soon as potential leads submit their contact information on your site. You can adjust the frequency, timing, or date of your email series from the time a lead opts-in to your site. All of the content included with our real estate website templates can be used as-is, edited, or completely re-written. The set up process for both Core Sites and Squeeze Pages is the same and each site requires its own unique domain name. Users can purchase domain names through Realeflow or use their own from an outside provider. Think of your core site as the main website that showcases your business and everything that it offers. Your core site is there to be informative and highlight what your business does and to whom it caters. 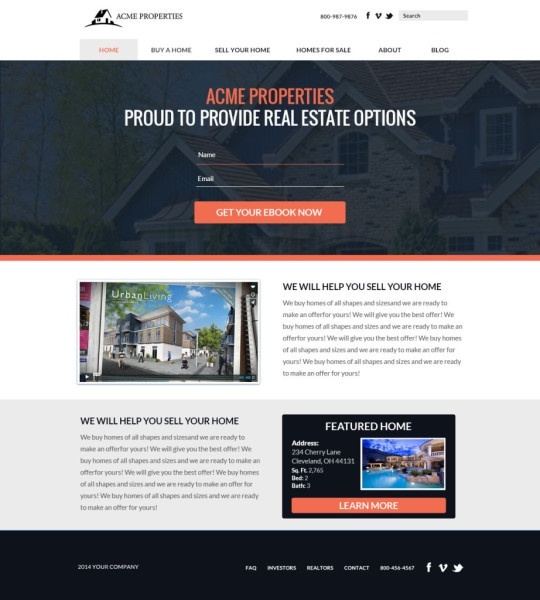 Each core real estate website template comes with pages for Buyers, Sellers, Private Lenders, Business Bio and more. You can also create your own page with a customized heading. 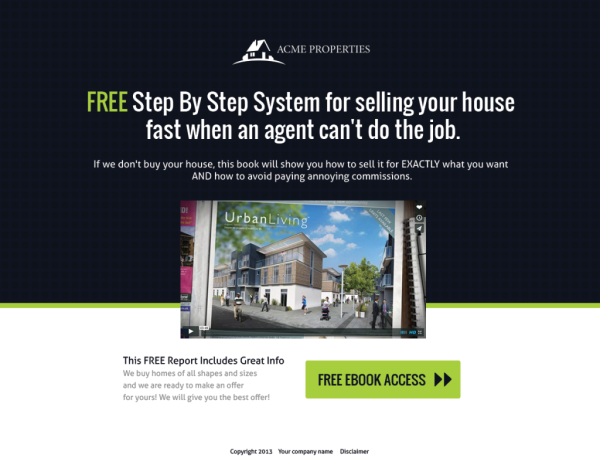 Every real estate website template includes an “Opt-in box,” which allows visitors to deposit their name, email, and phone number on your site. This automatically creates a contact file for the lead directly in the user’s Realeflow account, sends a notification, and initiates the appropriate autoresponder series. Realeflow’s squeeze page website templates are designed to target and convert numerous buyer and seller audience types including Cash Buyers, Private Lenders, Distressed Sellers, Buyers, and other Real Estate Investors. Realeflow’s real estate website templates provide numerous content packs with each focusing on a specific buyer or seller situation. Creating sites and copy designed for specific audiences immediately engages the visitor and helps the overall conversion of potential leads into deals! Once a content pack has been selected, the website will automatically include an autoresponder series and eBook suited for the target audience. Any of the content that Realeflow provides can easily be customized at anytime, but is not required. You already know that having a web-presence in today’s market is vital for the overall growth and success of your business. Not only can users set up numerous website types within Realeflow but, also, ensure that the leads visiting the site are being engaged in a way that is relevant, timely, and personalized. Learn more about how to put your business on the web using Realeflow’s real estate website templates here! Check back next week as we expand upon everything our Website Content Packs can do for you! I’d also love to hear from you so shoot me a line below about how you plan on putting your Real Estate Investing business on the map in 2015!